Wed., Nov. 7, 2018, 9:39 p.m.
Three consecutive state tournament appearances for the St. George’s Dragons have a common theme – Abby Jones and Maddy Christiansen, best friends since fourth grade. This season, the seniors have led a young squad to the State 2B/1B girls soccer tournament again. But it wasn’t supposed to happen like this. Christiansen was the soccer player, Jones was a basketball player. Neither contemplated playing any other sport. But before their sophomore seasons, the pair made a pact. If Jones came out for soccer, Christiansen would try her hand at basketball. A deal was struck and three state tournament trips later, Jones and Christiansen are right in the middle of it all. First-year head coach Logan Georgeadis came in from 3A Mt. Spokane to lead the Dragons to the state tournament again, leaning heavily on the two. “Definitely been a good year for us and I am glad I got the chance to coach the two of them before they graduated,” Georgeadis said. Jones is the captain on the basketball team, so she was obviously athletic. But her soccer knowledge severely lagged behind. “She didn’t know what position, she didn’t know how to trap the ball, she couldn’t kick the ball probably 10 yards,” Abby’s dad, Bob Jones, said. Christiansen helped Jones along in the early trials. As a result, Jones has turned herself into an unlikely poacher in front of goal. Christiansen gave the credit back to her friend and her coach. St. George’s plays Northeast 2B rival Northwest Christian on Saturday at 10:30 a.m. for the fourth time this season. The Dragons took two of three from the Crusaders this season – the most recent a 4-0 decision in the district title game on Oct. 30. Central Valley 5, Eastmont 2: Sailor Watson scored twice and the visiting Bears (15-1-1) defeated the Wildcats (10-7) in a State 4A first-round match on Tuesday. Kailyn LaBrosse added a goal and an assist. CV advances to a quarterfinal at Gonzaga Prep this weekend in a rematch of the District 8 title game. G-Prep edged Sumner 1-0 on Monday as Chelsea Le’s header in the 77th minute was the winner. Shorewood 1, Mt. Spokane 0: The Wildcats (11-9-1) were eliminated by the Thunderbirds (11-5-3) in a State 3A first-round match. Earlier results: On Monday, East Valley was bounced from 2A play by Burlington-Edison 3-2. 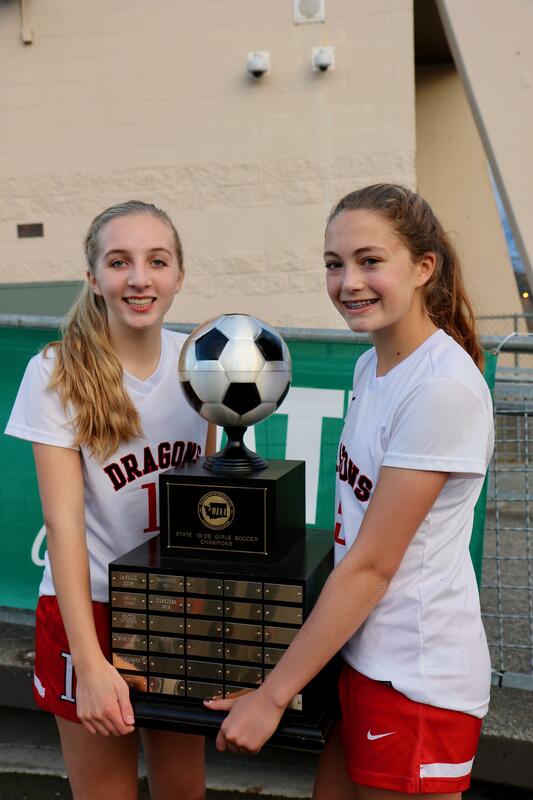 Kaitlin Harvey and Chloe Gellhaus had goals for the Great Northern League champs. In 1A play, Deer Park and Lakeside (Nine Mile Falls) won first-round games and advanced to face each other in a quarterfinal on Friday at 5:30 p.m. at Deer Park. Livvy Moore and Hannah Carnahan registered hat tricks in DP’s 11-3 win over Cle Elum-Roslyn. Lakeside routed Warden 6-1 as Lexi Torok scored a hat trick and added an assist. Freeman shut out Highland 4-0 and advanced to face La Salle in a quarterfinal this weekend. Brynn Van Orden delivered a goal and an assist while Hannah Plyant made eight saves. Published: Nov. 7, 2018, 9:39 p.m.